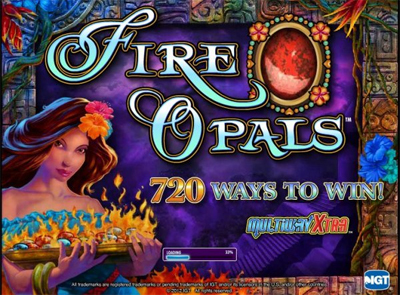 Fire Opals is among the new slot machines available at NetBet Casino. This slot launched recently by IGT is equipped with 5 reels and it brings 720 means to win the jackpot to players. Playing with this slot machine is an opportunity to take a holiday in Hawaii, in order to discover the culture of the inhabitants of this paradisiac island. Fire Opals stands out also by its unbelievable features which allow players winning free tours. The machine is also endowed with different amusing symbols such as Hawaiis girls, flowers, precious stones and volcanoes. If five logos of blazing opals are in a row on the reel, a jackpot Albums of 2,000 coins is guaranteed. On the other hand, during the appearance of five Hawaiis girls, 500 coins are to be won. Those who have the luck to see five scatter symbols appear on the reel will have the privilege to win 100 times of their total bet. As for it, the symbol bonus guarantees 10 free tours. By playing at this new gambling machine of NetBet Casino, its possible to pocket a very interesting earning. Its important to say that the online casino works in order to grant better rewards to its members. Now, several progressive gambling machines are available at NetBet Casino and the amount of each jackpot continues to shoot up. A big jackpot which is amounted at 13,515,251,866 is now waiting for the members of the casino. But those who like playing at the gambling machine Super Multitime Progressive will also be able to pocket 783,036.70 with a little chance.